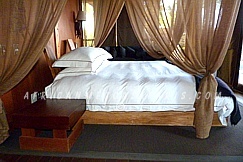 Xudum Concession is a concealed jewel set on the Xudum River in the southwest Okavango Delta. The expanse embraces a necklace of islands dotted with palms, figs, ebony and knob thorn trees, and is home to numerous of birds, plants and animals. The water nature of the habitat means it is the perfect place to experience the variety of species found within the Okavango Delta. The permanent swamp areas are lush and green, with groves of wild date palm, papyrus and water lilies growing around deep lagoons lined with riverine forest. Seasonal swamps, on the other hand, contain a network of small channels cutting their way through papyrus and reed beds to create islands of all shapes and sizes. The Xudum River is home to a large number of species, including a number of species adapted to the semi-aquatic lifestyle, such as the elegant red lechwe and shy sitatunga. Lion prides, cheetah, leopard and African wild dog are occasionally encountered, while families of hippo hide in the deeper channels and lagoons. The area supports the continent’s largest surviving concentration of elephant and buffalo, while roan and sable antelope are occasionally spotted in the open woodlands. Xaranna Camp enjoys luxurious solitude on its own Delta island within a 25000 hectare (61800 acres) exclusive wildlife concession. 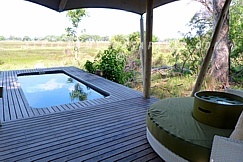 Taking its inspiration from the water lily, Xaranna is a delightful camp with just nine sleek en-suite safari tents that combine canvas and bleached timber. Xudum Lodge lies deep within an exclusive 25000 (61800 acres) hectares wildlife concession surrounded by a mosaic of papyrus and reed beds. The nine playfully crafted split-level safari suites, boasting handsome tones of chocolate and ebony, feature large bathtubs and romantic al fresco showers.